1. What Makes Traderush Different Than Other Brokers? “We offer different tools, such as the roll over that allows you to postpone your expiry to the next available expiry time…. Double up that creates a trade with the same conditions… And sell that allows you to buy yourself out before expiry… Additionally we offer an % 10 refund for most of the positions even when out of the money… We offer payout up to 81%”. 2. What Binary Options Trading Education Traderush Offers For Newbies? “Please see the following link for our Binary Options Trading Guide… http://trade.rushbucks.com/files/PDFs/TradeRush_BriefGuide_withLOGIN.pdf … We offer many benefits as part of our investor packages… They are free, however the different packages require a certain amount of deposit… Based on what is the package… There are different packages available… The package offering one on one trading with a professional market analyst requires a deposit of $ 1000”. 3. How Big Is Traderush Bonus Wager? Would I Be Able To Withdraw Without Fulfilling The Bonus Requirements? 5. Can You Provide Me an Account Manager*? 6. Can I Open a Demo Account on TradeRush? The chat with TradeRush support guy was helpful. The guy on the other side was accurate and very fast in the responses. In the beginning he tried to force me to open an account and then to talk with the account manager to help me further, but after I told him that I want direct answers from him, he continued the conversation without any further attempts to force me to register account. Somewhere in the middle of the chat the guy transfer my conversation to other person, but the conversation continued in very good shape after that moment too. The time for response was also very fast and the answers were not as in some other brokers predefined and copy pasted. 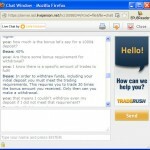 Please read TradeRush Review upon deciding. *Account Manager – Some Brokers offers their clients an account manager. His job is to trade with your money, allegedly earning profits for you. ThatSucks.com (former BinaryOptionsThatSuck.com) generally doesn’t recommend our readers to use this option. Could you send me your FAX no for your accounting dept?